He or She… what will it be? Sugar and spice, and everything nice, that’s what little GIRLS are made of!!! We are expecting a baby girl this time! We are completely shocked and very happy. We were sure that this was going to be our 3rd boy. This sweet little baby girl is going to be decked out in lots of pink 🙂 I look forward to shopping for her and decorating her nursery. She is going to have two big brothers that will love her so much and always look out for her. I can’t wait until there are 30 little toes in this picture! PS – If you like the crocheted baby booties be sure to check back tomorrow for the free pattern! Congrats! I'm expecting a girl in August. I have a 3.5 year old girl already, they are tons of fun! Congratulations! My 6 year old is so good with his little 3 year old sister (most of the time. Your boys will absolutely love (and torment) her. Wow so happy for all of you and love all your designs i will be back for tomorrow to get the bootie pattern to go with all the others i have used from your page. ♥ your page! CONGRATULATIONS TO ALL OF YOU! That gave me goosebumps! <3 Congrats! congratulations, I had 7 daughters so am partial to girls, I see alot of girlie items in our future! Congratulations! Thats so great for you all! Congrats!! Very excited for you!!! Congrats! So exciting! We had to wait 28 years between girls (between when my youngest niece was born and when she had *her* daughter)! Everything in between, including my own, were boys! So much fun to have a little girl to spoil and deck out like a princess! Ohhhh! Una niña! Seguro que estáis muy emocionados. Sus hermanos la cuidarán muchísimo! Enhorabuena! Congratulations!!! The boys are going to love having a baby sister. Congratulations!!! I am very happy for you!!! Congratulations! I've got 2 grandsons and another grandson on the way in Aug! Congrats!!! We are now going to get to see your Blog go PINK!!! Congrats I'm so happy for you & your family!! My daughter is expecting a little girl in August and she will have a big brother too! Congrats, Sarah! I'm so happy for you. A girl will be so much fun after 2 boys! I love love the picture you posted on Facebook to click over! How creative! Congratulations!!! We have 2 girls and they are A LOT of fun! 🙂 Thanks for sharing your news with us! Good luck with the rest of your pregnancy! Congratulations!! So happy for you and what a fun way to reveal the gender!! Congrats ~ so happy for you all! Beautiful pictures and reveal! Yay! I'm so glad you are finally getting a girl! congrats! That is such a cute announcement! So Happy for you… I have 3 children too! 2 Girls and 1 Boy… And 1 Granddaughter and 1 Grandson,, They are all a blessing! May God Bless your family! Congratulations! Time to go pink crazy!! Congratulations! Start hooking pink and purple now! Congratulations. What a wonderful blessing for you and your family! such a cute post!! congrats! Congratulations!!! I am expecting my first granddaughter in August. I hope all will be fine for you and your family. So exciting! Barbara must be beside herself! I am going to FL this weekend and I'm sure I'll hear all about it. Congrats. Awwww! Congratulations!! I kept hoping for a girl but stopped after 4 boys. This will be so fun and exciting for you. A whole new journey…and two big brothers to protect her when she gets older. How nice!! Aww–congratulation!~ I DID have 3 boys! LOL I see lots of girl patterns in the future?! Blessings..
How wonderful congratulations! Since I have 7 granddaughters I'm sure you'll come up with some great ideas to dress her. I also have 3 grandsons and have enjoyed your blog so much. Thanks for sharing your ideas and talent with us. Congratulations!!! I have 2 boys as bookends and three girls in the middle. So happy you were blessed with a girl. Congratulations! What a cute way to announce! Congrats!!!!!!! I have 5 daughters & a grand-daughter lol… Lots & lots of girls around here… They are absolutely precious! OMGosh, Sarah!! A Girl!! You ARE so Blessed! Nothing Like a Precious Little Girl. I am a "Regular" to your site ….. I'm Probably here at least once a week to see what you're up to! You are such a Fabulous Mom! 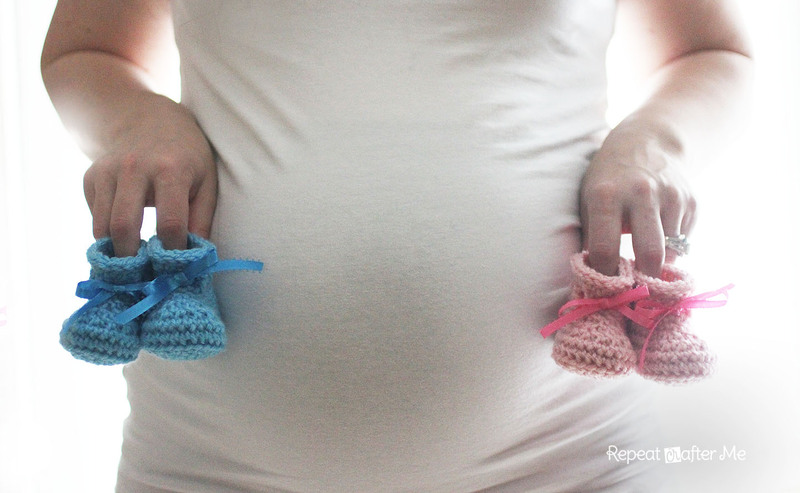 We'll Certainly Be Praying For Your Little One's Safe Arrival in September. Congratulations!! As a mum of two boys (3 and 2 years old) and a girl (10 months old) I can say it's a wonderfull combination of joy. Three children.. so much love! Yay, I'm SO happy for you and your family!! We had 4 boys before we got our beautiful baby girl! She's 4 months old now and I am having a great time shopping for PINK clothes and crocheting her lots of cute stuff, including your cupcake hat! Congrats!! I'm expecting a baby next year, March. We haven't found out the gender yet, but we're crossing our fingers for a baby brother for my eleven year old to-be big sister! 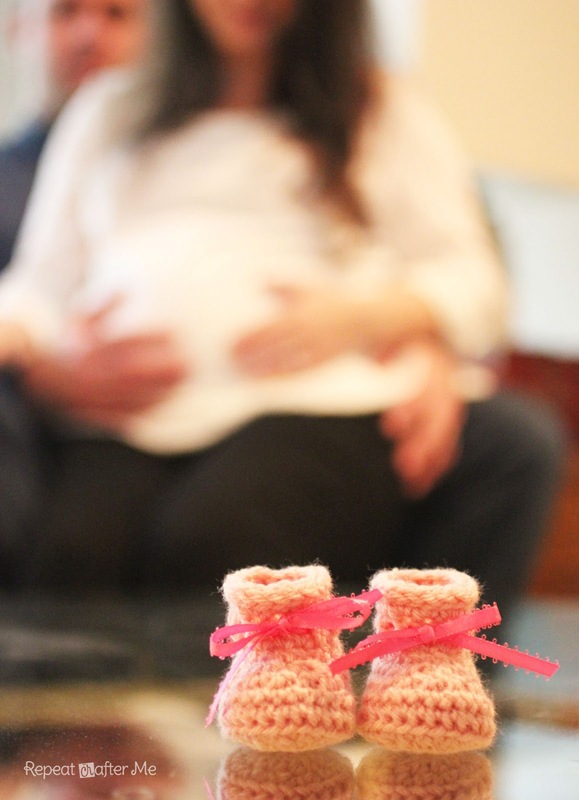 just wanted to let you know that one of your photos has been featured on one of my most successful posts:baby gender reveal ideas.